1,374 pages | 19 B/W Illus. 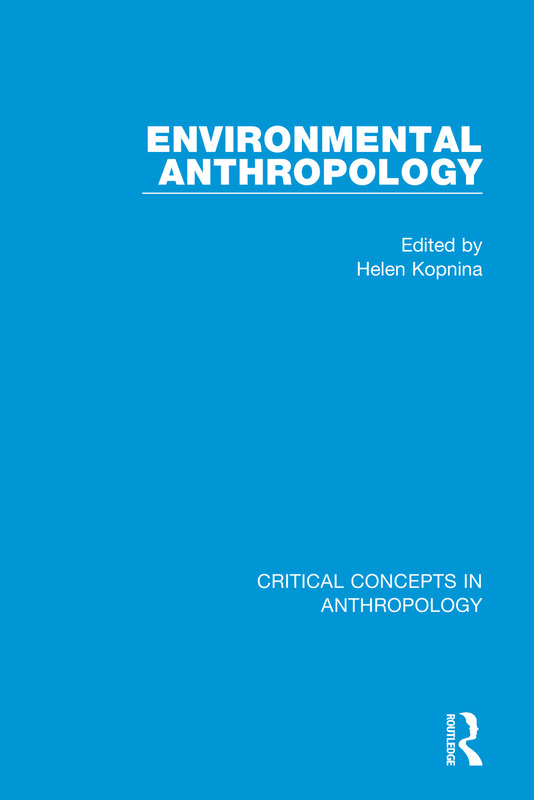 As environmental anthropology flourishes as never before, this new four-volume set from Routledge meets the need for an authoritative reference work to make sense of a rapidly growing and ever more complex corpus of academic and practical literature. Edited by a leading scholar, the collection assembles foundational and canonical work, together with innovative and cutting-edge applications and interventions. Fully indexed and introduced by Helen Kopnina, the four volumes provide a one-stop resource for all interested researchers, teachers, and advanced students who wish to understand how this thriving subdiscipline has emerged, and where it is today. 1. Richard J. Parmentier and Helen Kopnina-Geyer, ‘Excerpts from Pacific Diaries of N. Makloucho-Maclay’, ISLA: A Journal of Micronesian Studies, 1996, 4, 1, 71–108. 2. Julian H. Steward, ‘Problems of Cultural Evolution’, Evolution, 1958, 12, 2, 206–10. 3. George W. Stocking Jr., ‘Franz Boas and the Culture Concept in Historical Perspective’, American Anthropologist, 1996, 68, 867–82. 4. Jack Goody and Ian Watt, ‘The Consequences of Literacy’, Comparative Studies in Society and History, 1963, 5, 3, 304–45. 5. James George Frazer, ‘Tree-Worship’, The Golden Bough: A Study in Comparative Religion (Macmillan and Co., 1894), Vol. I, pp. 57–96. 6. Marvin Harris, ‘The Cultural Ecology of India’s Sacred Cattle’, Current Anthropology, 1966, 7, 1, 51–66. 7. Fredrik Barth, ‘Ecologic Relationships of Ethnic Groups in Swat, North Pakistan’, American Anthropologist, 1956, 58, 1079–89. 8. Roy Rappaport, ‘Ritual Regulation of Environmental Relations Among a New Guinea People’, Ethnology, 1967, 6, 17–30. 9. Bronislaw Malinowski, A Diary in the Strict Sense of the Term, 2nd edn. (Routledge & Kegan Paul, 1989), pp. 3–16. 10. Benson Saler, ‘E. B. Tylor and the Anthropology of Religion’, Marburg Journal of Religion, 1997, 2, 1, 1–6. 11. Conrad P. Kottak, ‘The New Ecological Anthropology’, American Anthropologist,1999, 101, 1, 23–35. 12. Helen Kopnina and Eleanor Shoreman-Ouimet, ‘Introduction: Environmental Anthropology of Yesterday and Today’, inHelen Kopnina and Eleanor Shoreman-Ouimet (eds. ), Environmental Anthropology Today (Routledge, 2011), pp. 1–33. 13. Eugene N. Anderson, ‘Drawing from Traditional and 'Indigenous' Socioecological Theories’, in Helen Kopnina and Eleanor Shoreman-Ouimet (eds. ), Environmental Anthropology Today (Routledge, 2011), pp. 56–74. 14. Kay Milton, ‘Introduction’, Loving Nature: Toward an Ecology of Emotion (Routledge, 2002), pp. 1–7. 15. Paul Rabinow, ‘Artificiality and Enlightenment: From Sociobiology to Biosociality’, in M. Biagioli(ed. ), The Science Studies Reader (Routledge, 1999), 234–52. 16. David Kidner, ‘Fabricating Nature: A Critique of the Social Construction of Nature’, Environmental Ethics,2000, 22, 339–57. 17. Arran Stibbe, ‘Language, Power and the Social Construction of Animals’, Society & Animals, 2001, 9, 2, 145–61. 18. Margaret Mead, ‘Human Fatherhood is a Social Invention’, Male and Female (Penguin Books, 1974), pp. 177–91. 19. Vandana Shiva, ‘Women in Nature’, Staying Alive: Women, Ecology and Survival in India (Zed Books, 1988), pp. 37–52. 20. Loraine Thorne, ‘Kangaroos: The Non-Issue’, Society and Animals,6, 1998, 167–82. 21. Donna Haraway, ‘Chicken’, When Species Meet (University of Minnesota Press, 2008), pp. 265–74. 22. Sian Sullivan, ‘Green Capitalism and the Cultural Poverty of Constructing Nature as Service Provider’, Radical Anthropology, 3, 2009, 18–27. 23. Marina Padrão Temudo, ‘"The White Men Bought the Forests": Conservation and Contestation in Guinea-Bissau, Western Africa’, Conservation and Society, 2012, 10, 4, 354–66. 24. Gregory Bateson, ’The Roots of Ecological Crises’, Steps to an Ecology of the Mind: Collected Essays in Anthropology, Psychiatry, Evolution, and Epistemology (University of Chicago Press, 1972), pp. 494–8. 25. J. Kenneth Smail, ‘Remembering Malthus III: Implementing a Global Population Reduction’, American Journal of Physical Anthropology, 2003, 122, 295–300. 26. James, R. Veteto and Joshua Lockyer, ‘Environmental Anthropology Engaging Permaculture: Moving Theory and Practice Toward Sustainability’, Culture & Agriculture,2008, 30, 1 & 2, 47–58. 27. Merrill Singer and Jacqueline Evans, ‘Water Wary: Understandings and Concerns about Water and Health Among the Rural Poor of Louisiana’, in Helen Kopnina and Eleanor Shoreman-Ouimet (eds. ), Environmental Anthropology: Future Directions (Routledge, 2013), pp. 172–87. 28. R. Simkins, ‘The Bible and Anthropocentrism: Putting Humans in Their Place’, Dialectical Anthropology, 2014, 38, 297–413. 29. Veronica Strang, ‘Justice for All: Inconvenient Truths and Reconciliations in Human and Non-Human Relations’, in H. Kopnina and E. Shoreman-Ouimet (eds. ), Routledge Handbook of Environmental Anthropology (Routledge, 2016). 30. Clifford Geertz, ‘Deep Play: Notes on the Balinese Cockfight, in The Interpretation of Cultures: Selected Essays (Basic Books, 1973), pp. 412–55. 31. Jane Desmond, ‘Requiem for the Roadkill’, in H. Kopnina and E. Shoreman-Ouimet(eds), Environmental Anthropology: Future Directions (Routledge, 2013), pp. 46–58. 32. Andrea Pieroni, ‘Local Plant Resources in the Ethnobotany of Theth, a Village in the Northern Albanian Alps’, Genet Resour Crop Evol, 2008, 55, 1197–214. 33. Marshall Sahlins, ‘The Domestic Mode of Production: The Structure of Underproduction’, Stone Age Economics (Aldine, 1972), pp. 41–99. 34. David Lewis, ‘Anthropology and Development: The Uneasy Relationship’, in James G. Carrier (ed. ), A Handbook of Economic Anthropology (Edward Elgar, 2005), pp. 472–86. 35. Mark Nuttall, ‘Tipping Points and the Human World: Living with Change and Thinking about the Future’, AMBIO, 41, 2012, 96–105. 36. Renzo Taddei, ‘Anthropologies of the Future: On the Social Performativity of (Climate) Forecasts’, in H. Kopnina and E. Shoreman-Ouimet (eds. ), Environmental Anthropology: Future Directions (Routledge, 2013), pp. 246–65. 37. Richard Wilk, ‘Consuming Ourselves to Death: The Anthropology of Consumer Culture and Climate Change’, in S. Crate (ed. ), Anthropology and Climate Change: from Encounters to Actions (Duke University Press, 2009), pp. 265–76. 38. Cindy Isenhour, ‘On Conflicted Swedish Consumers: The Effort to Stop Shopping and Neoliberal Environmental Governance’, Journal of Consumer Behavior, 9, 2010, 454–69. 39. Ben Campbell, ‘Changing Protection Policies and Ethnographies of Environmental Engagement’, Conservation and Society, 3, 2, 2005, 280–322. 40. Leslie E. Sponsel, ‘Human Impact on Biodiversity: Overview’, in Simon Asher Levin (ed. ), Encyclopedia of Biodiversity (Academic Press, 2013), 4, 137–52. 41. Kay Milton, ‘Introduction: Environmentalism and Anthropology’, in Kay Milton (ed. ), Environmentalism: The View from Anthropology (Routledge, 1995), pp. 1–17. 42. Peter Brosius, ‘Green Dots, Pink Hearts: Displacing Politics from the Malaysian Rain Forest’, American Anthropologist, 1999, 101, 1, 36–57. 43. Paige West, ‘Translation, Value, and Space: Theorizing an Ethnographic and Engaged Environmental Anthropology’, American Anthropologist, 2006, 107, 4, 632–42. 44. Robert Efird, ‘Learning by Heart: An Anthropological Perspective on Environmental Learning in Lijiang’, in H. Kopnina and E. Shoreman-Ouimet (eds. ), Environmental Anthropology Today (Routledge, 2011), pp. 253–66. 45. Tapoja Chaudhuri, ‘Learning to Protect: Environmental Education in a South Indian Tiger Reserve’, in H. Kopnina (ed. ), Anthropology of Environmental Education (Nova Science Publishers, 2012), pp. 87–113. 46. Susan Charnley and H. William Durham, ‘Anthropology and Environmental Policy: What Counts?’, American Anthropologist, 2010, 112, 3, 397–415. 47. Jeremy Spoon, ‘Quantitative, Qualitative, and Collaborative Methods: Approaching Indigenous Ecological Knowledge Heterogeneity’, Ecology and Society, 2014, 19, 3, 33. 48. Joanne Vining, ‘The Connection to Other Animals and Caring for Nature’, Human Ecology Review,2003,10, 2, 87–99. 49. Emilio F. Moran and Eduardo S. Brondizio, ‘Human Ecology from Space: Ecological Anthropology Engages the Study of Global Environmental Change’, in Ellen Messer and Michael Lambek(eds. ), Ecology and the Sacred: Engaging the Anthropology of Roy A. Rappaport (University of Michigan, Press, 2001), pp. 64–87. 50. Andrew P. Vayda and Bradley Walters, ‘Against Political Ecology’, Human Ecology,1999,27, 1, 167–79. 51. Arthuro Escobar, ‘Difference and Conflict in the Struggle over Natural Resources: A Political Ecology Framework’, Development, 2006, 49, 3, 6–13. 52. William R. Catton Jr and Riley E. Dunlap, ‘Environmental Sociology: A New Paradigm’, American Sociologist,1978, 13, 41–9. 53. Eileen Crist, ‘Abundant Earth and the Population Question’, in P. Cafaro and E. Crist (eds), Life on the Brink: Environmentalists Confront Overpopulation (University of Georgia Press, 2012), pp. 141–53. 54. Robyn Eckersley, ‘Ecocentric Discourses: Problems and Future Prospects for Nature Advocacy’, Tamkang Review, 2004, 34, 3/4, 155–86. 55. Leah S. Horowitz, ‘Translation Alignment: Actor-Network Theory and the Power Dynamics of Environmental Protest Alliances in New Caledonia’, Antipode, 2012, 44, 3, 806–27. 56. Paul Stern, ‘Toward a Coherent Theory of Environmentally Significant Behavior’, Journal of Social Issues, 2000, 56, 3, 407–24. 57. Jody Emel, Chris Wilbert and Jennifer Wolch, ‘Animal Geographies’, Society & Animals, 2002, 10, 4, 1–6. 58. Arne Naess, ‘The Shallow and the Deep: Long-Range Ecology Movement. A Summary’, Inquiry,1973, 16, 95–9. 59. Dale Jamieson, ‘Animal Liberation is an Environmental Ethic’, Environmental Values, 1998, 7, 1, 41–57. 60. Bron Taylor, ‘Editor’s Introduction: Encountering Leopold’, Journal for the Study of Religion, Nature and Culture, 2011, 5, 4, 393–6. 61. Stephan Kaplan, ‘Human Nature and Environmentally Responsible Behavior’, Journal of Social Issues, 2000, 56, 3, 491–508. 62. Agustín Fuentes, Jonathan Marks, Tim Ingold, Robert Sussman, Patrick V. Kirch, Elizabeth M. Brumfiel, Rayna Rapp, Faye Ginsburg, Laura Nader, and Conrad P. Kottak, ‘Vital Topics Forum: On Nature and the Human’, American Anthropologist, 2010, 112, 4, 512–21. 63. P.Cafaro andR.Primack, ‘Species Extinction is a Great Moral Wrong’, Biological Conservation,2014, 170, 1–2. 64. Kent, H. Redford, ‘Forum: Misreading the Conservation Landscape’, Fauna & Flora International, 2011, 45, 3, 324–30. 65. James Igoe, ‘Forum. Rereading Conservation Critique: A Response to Redford’, Fauna & Flora International, 2011, 45, 3, 333–4. 66. Deborah Bird Rose, Thom van Dooren, Matthew Chrulew, Stuart Cooke, Matthew Kearnes, and Emily O’Gorman, ‘Thinking Through the Environment, Unsettling the Humanities’, Environmental Humanities, 2012, 1, 1–5. 67. Lilian Na’ia Alessa, ‘Schooling the World: The White Man’s Last Burden’ (2010) (www.schoolingtheworld.org).